We at MOKULUA HPB pride ourselves in providing you with quality, personal service from the first consultation to the last finishing touches. Your home means just as much to our ‘ohana as it does to yours, so take some time get to know our highly skilled and passionate team. Joleen has been with Mokulua since inception as manager of all things admin, more formally, Director of Accounting and HR. She keeps the lights on, the wheels moving and the Aloha flowing! Chris came to Mokulua as a carpenter in 2010, taking an interest in the administrative side of the business, he switched roles in 2012 as a Project Manager. With a background in finance, he has mastered the art of value engineering and has plenty of adoring clients to show for it. Nathan was the inspiration behind Mokulua Masonry, a branch of Mokulua HPB. Sporting over 30 years experience, there's not much he hasn't done, having a particular nack for artistic masonry finishing. Barry brought his expertise to Mokulua in 2010 as a well-rounded carpenter. It wasn't long before he settled into his role as a project super. He continues to lead by example pushing Mokulua to unparalleled levels of quality and craftsmanship. Dan joined the Mokulua 'Ohana in 2010 with an eye for finishing. A natural leader and fast learner, he has been running jobs since 2015. His attention to detail in every aspect of home building is a big part of Mokulua's success. We value his work ethic of, Aloha first, while managing the job site. Mike founded Mokulua in 2005, serving as Principle RME and Project Manager. He holds a number of green building credentials and strives to improve the qualify of life for all Mokulua's clients by ensuring a product built on the values of honesty, purpose and passion. Mike Fink was born and raised in Manchester, Connecticut, an avid outdoorsman and free spirit, he made his first trip to Hawaii visiting his sister and scoring a summer job as Mokulua Carpentry's first employee. Well before Mokulua HPB was established, he worked alongside Mike, learning the basics of carpentry and talking story about the environment and the similar interests they shared for green building. He returned to the mainland, attending Johnson State College in Vermont, graduating with a B.S. in Environmental Science. Mike made another more permanent trek to Hawaii in 2011 and assumed his role as a carpenter yet again, this time under the banner of Mokulua HPB. 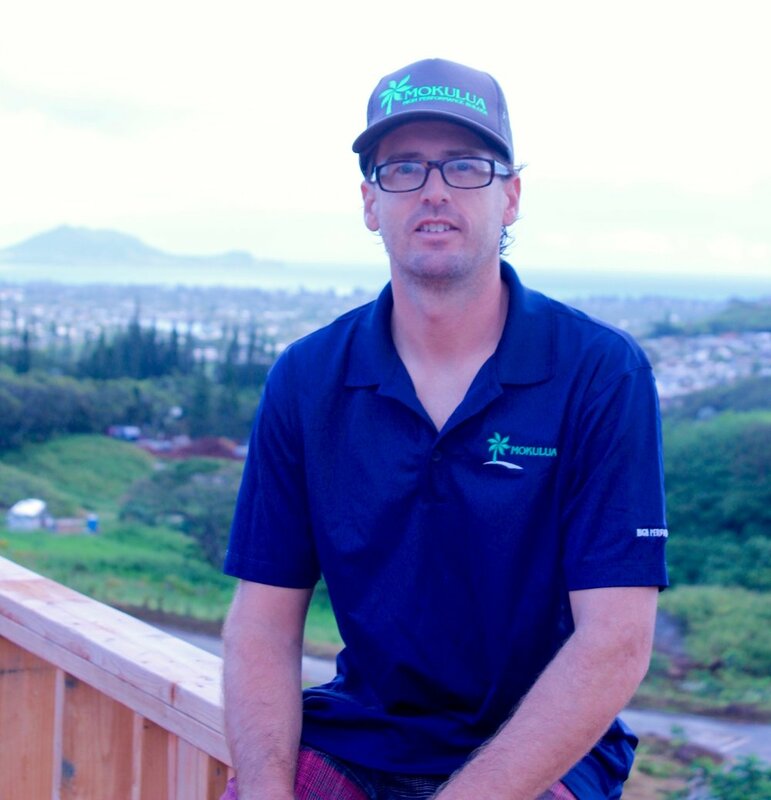 A welcome asset to the Mokulua 'Ohana, Mike displayed a great work ethic, alongside his commitment and ongoing desire to learn and promote green building. His knowledge served well as a carpenter on the award winning LEED Platinum Home at Wa'ahila Ridge. Perhaps Mike's most impressive tool was his ever constant fun loving character that brought a positive spirit to any job-site or get together. A passionate and amazing musician/guitar player, Mike's jam sessions took him all around town, whether at the Wall 'Ohana jamming with Barry, at a beach bbq, or any number of local restaurants, he was always sharing in the groove. Mike will forever be a part of the Mokulua 'Ohana and in the spirit of our work. Aloha Mike, we love you.